Finding nondairy foods that contain plenty of calcium isn’t difficult. In fact, many nondairy foods have calcium, so make sure you eat them often. Remember that horses, elephants, cows, and giraffes get all the calcium they need to build their massive skeletons by eating nothing more than plants (after the species-specific milk they drink in infancy, of course). The following lists the calcium content of some common nondairy sources of calcium. You don’t need to count the milligrams of calcium in your diet. However, you may find that a quick scan of this table helps you get a feel for how rich in calcium some foods are compared with others. The good news: A lot of other plant foods contain plenty of calcium that’s well absorbed. In fact, some research suggests that the calcium in many plant foods is absorbed by your body better than the calcium in cow’s milk. 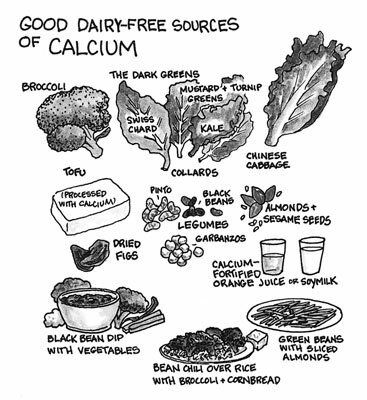 Good examples of some of these calcium sources include broccoli, Chinese cabbage, and kale. So getting your calcium from these nondairy sources is a smart choice. Even if you don’t drink milk or eat other dairy products, it’s not difficult to pack plenty of calcium into your meals. The following are healthful examples of calcium-rich meals, snacks, or dishes.